High Scores are formatted better now. BIG UPDATE. This will probably be the last before submitting to the App Catalog. Please leave feedback so I can get my app accepted! The basic gameplay revolves around flinging the polar bear into the hole. Be careful, if you fling him to fast he will slide right over the hole. When doing this you must consider the direction of the wind and adjust your flick angle and velocity accordingly. You can figure out the wind direction by looking at the red arrow in the top left corner. This arrow will change directions after every attempt. 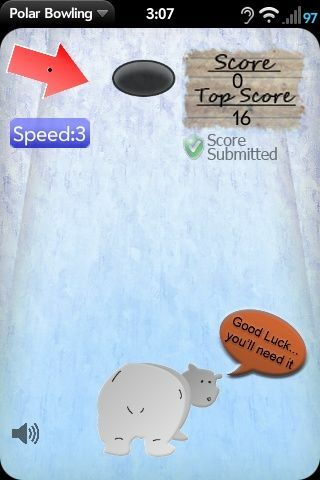 If you sucessfully get the polar bear into the hole, your score will increment one. It will keep on doing this untill you miss, and then go back down to zero. You will be prompted to enter a top score after you miss at the end of a streak.